Kvalvik Bait for anglers currently consists of a range of 3 different bait creams specifically developed to attract cod, halibut, and salmon/trout respectively. Kvalvik Bait adds a powerful scent to lures to attract various kinds of fish and contains a soft, biodegradable adhesive that ensures a gradual release when you are fishing. The products have been scientifically developed in collaboration with leading research groups in Norway, and all products have scientifically documented effects. 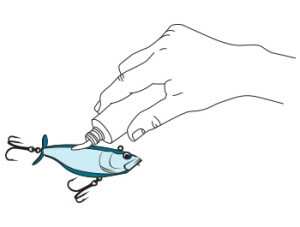 When you are fishing for cod with Kvalvik Bait, you apply the cream directly onto your preferred fishing lures. When using rubber lures, it is recommended that you rub the cream on the inside to have the scent locked in for a longer period. The figure above shows how Kvalvik Bait is applied on typical lures that are in use today. The video below shows one of the cod experiments from Tromsø Aquaculture Research Station. When fishing for halibut with Kvalvik Bait, you should create a horizontal cut on the bottom part of the jig. Alternatively, you can also buy a modern jig that has a hole where you can inject scented bait. 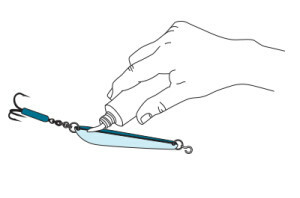 The figure above shows a typical jig used today and how the bait should be directly applied. The video below shows one of the halibut experiments from Tromsø Aquaculture Research Station. The halibuts had been laying still at the bottom of the tanks for days until they got scent of the amino mixture that eventually ended up in the Kvalvik Bait Halibut tubes. See how the largest halibut nearly destroyed the entire feeding rig used in the experiments! When fishing for salmon or trout, apply the cream directly to your lure or fly. Massage the cream into the body of the fly with your finger tips. The figure above show application to a typical wet fly. 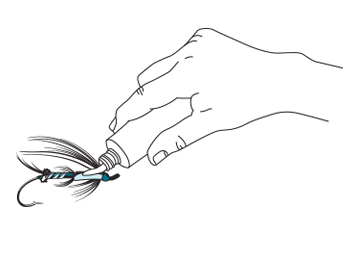 Be advised that you should not use Kvalvik Bait on dry flies, as it will decrease its floating ability. The video below shows a short demonstration of how you can apply the Kvalvik Bait to your typical sea trout flies.